1) April 1st was Easter Sunday in 1888. Morning - About town various jobs. Afternoon - 2pm. Selling by Auction at cottage near the Silkmill. Evening - Making up and forwarding monthly cash sheet to Bell and Co and cheque from dad. Home doing up own books. Mr Turner, Broad Gate, called and said he would give me 25 pounds for Stonier's stack. At any rate I am to drop him a line when I get an answer to my letter of the 31st. 1) The silk mill (Cecily mill) located next to Cecily Brook on Oakamoor Road functioned from 1851 to 1981. The site is now owned by JCB. In House all the day. Evening - Writing letters etc. Ethel and Ursula are down with measles and Bert has fire in her bedroom and keeps them there packing(?) and the seem to be getting on right. Morning - Walked over Draycott Cross to Cresswell Station and then by 12:00 train to Leigh. Called on Mrs Hollins and afterwards called at Tittertons and had bit bread and cheese there. Titterton tells me he is paying 4 pounds per acre annual rent and the Mrs says that she can't save through to buy her a new frock once during 12 months. Shes says all goes to the landlord. Walked from Leigh thro Lower and Upper Tean and to Cheadle. Evening - At Walton Villa preparing Brewery cash sheet etc. Preparing balance sheet regarding Ford Haye Colliery distraint(?) and settling with Mr Masefield regarding same. Writing out copy particulars of sale. Total - 9 pounds 5 shillings and 4 pence. Dad keeps very ill, poor old chap. He comes down stairs a bit. He says the pain (rheumatics) is all over him. He wanted me to put him in a vapour bath but the weather keeps so cold. Morning - To Rindle inspects repairs required. To re measure Stoniers hay stack. I only make 6 tons of it now. Afternoon - To Walton Villa, going thro Rindle Rents and preparing balance sheet and forwarding to Harding. Saw John(?) Fielding of Alton at the Greyhound and arranging with him regarding proposed sale of quarry plant. Evening - Writing letters and to Hammersley Hayes and settled with Mr Bowers regarding Ford Hayes Colliery Rent 120 pounds. Ground all covered with snow. Drawing up list of prices of sale posters by various firms and other office work. Afternoon - to Hammersley Hays to see Mr Bowers but he was out. I saw him at the Sheaf after and arranged to go up tomorrow night. Rindle for rents - evening. 1) The Sheaf is the Wheatsheaf Hotel - a pub on Cheadle High Street, which is still there. Morning - At 10, started from Cheadle and walked to Oakamoor to meet Mr Lees regarding valuation at Wood Farm. Mr Mottram did not come. Lees says that Wooddison(?) has shifted all the hay stack off the farm. Lees says he has settled with Mr Minor's(?) Shrewsbury's agent that the Landlord shall take to the fixtures from Wooddison and so save him any further bother. The valuation will therefore require writing out. Lees asked me to send him my account for this job. I think 2 guineas(?) would not be one penny too much considering my 3 journeys to Oakamoor, interviews in Cheadle and letter writing regarding this matter. Afternoon - Sundry office work. Mr Ridge, grocer, confided to me that he intended going to New Zealand. 1) One guinea was equivalent to one pound one shilling. At 9:30 started with Payne and trap from Cheadle and drove to Dividy Lane and Ford Hayes Colliery. Began sale at 11:45 and realised 150 pounds 5 shillings and 11 pence or about 10 pounds for little(?) to pay all expenses etc. George Charlesworth from Gorsty Cote there and had tea and I settled up with him for his sale. Took my account 5 pounds for selling cottages last night to Godwin and he paid me right off. Inventing a few new styles of twin pens. Balancing up Godwin's Sale Book. Late Mrs Hickenbotham's Sale. Evening - Going thro Sale accounts with Payne to find error 2 shillings and 6 pence deficit. Hartshill. Walked to Stoke then by train to Longton. Called on Byatt regarding his mother's property sale. Longton to Blythe Bridge by train and called to see late Mr Glover's sale now on at Blythe Bridge. Edwards. Auction in tent (catalogs 6?). Then walked to Cheadle and called at Rindle for Rents. To Blythe Bridge by 2:30 coach. To Longton and got Bills 200 demy (double) printed at Mr Brickels(?) - 16 shillings and 6 pence. Gave Harvey 50 for Longton, Myatt 50 for Stoke and Henshall 100 for Hanley and Burslem. Walked from Longton to Ford Hayes Colliery, gave Matey copy extension of distraint till Friday next. Then to Bucknall walked - had tea with Mr Brown and then to station - to Stoke and Hanley thence to Hartshill for the night. Morning - To Longton. Called on Mr Lloyd, auctioneer and we went together to Dividy Lane. He made valuation in conjunction with Mr Jno(?) Brown from Bucknall. I returned to Longton with Mr Lloyd and he handed me draft valuation then I called at Wilson in Gate Street and had tea and home by rail and coach. Evening - Writing out Sale poster ready for Monday to be printed at Longton 200 double demy. Odd jobs in office. Afternoon in Market etc. Evening - To Pig and Whistle with Bert to see Will Bowers with regard to Dividy Lane distraint. Morning - Left Hartshill at 7:40. Left Stoke station for Bucknall 8:15. Walked Bucknall to Ford Hays Colliery, 1 and half miles. Saw Mr Britton(?) regarding appraisement. He will do for one and Mr Brown, Farmer, Bucknall, for other. Saw Matey and then on to Longton, a 2 mile walk but easier route than Bucknall. Longton to Blythe Bridge 12:00. Coach home. Dinner and then to C. Hickenbotham's Sale of furniture at 1 o'clock. Good sale but weather bad, snowing etc. Payne clerked. Evening - Home writing up books etc and after to Alton Castle too see payne and received 13 pounds 2 shillings and 7 pence on account sale today. Morning - Saw Mr Blagg, Solicitor, at his office at 10:30 regarding sale of late Hickenbotham's property in Chapel Street and to view the cottages and assisting Mr Blagg in framing particulars. Home for dinner and by coach to Blyth Bridge to Longton saw Bill poster and met Spittle and had glass beer with him. To Stoke, saw Myatt Bill poster and on to Hanley. Saw Mrs Henshall, poster and to pts(?) offices. Keates and allbut(?) and Daniels and had tea at eating House then walked to Hartshill to stay for night. Longton - Sam Harvey, 20 Market Lane, Longton. 50 Bills for Longton. Stoke - Myatt. 50 Bills for Stoke and Fenton. Hanley - Mrs Henshall, 12 Pall Mall. 100 Bills for Hanley and Burslem. Charge 8 shillings per 100 for posting double demy. Out all day with Mr Tomlinson for Bell and Co. to Tean, Gorsty Hill, Winnoth(?) Dale, Cheadle Common, Freehay, Rakeway and home about 6pm looking up accounts. Awfully cold day and came on to Snow about 3pm. Some of the customers seem offended at Bells writing them regarding their accounts out. Only collected tween 40 and 50 shillings. Evening - Drawing on Ice(?) Tracing Cloth a Ground plan of "Cumberland House" at Cheadle, for R. Plant - at it till 12pm as Jim Barker wants to forward it to London first post tomorrow. Half inch scale. Ball made plan on Board first and I traced from that, had not time today to take my own measurements. Morning - To premises of late Mrs Hickenbotham, Chapel Street, taking inventory for Sale along with Mr Godwin. Afternoon - Getting out above sale Bill to Hammersley Hayes to see Will Bowers regarding distraint and after to see Mr Masefield regarding the same. Evening - Rindle for rents and to Walton Villa, going thro Bells ale accounts with Mr Tomlinson, from Bell and Co. Burton, and dad. Afterwards with Mr T, visiting various pubs - customers. After, Home, writing up reports regarding my lecture for newspapers till 12:30pm. Morning - Took Westons to Fowles(?) Cottage, Bulls Head, lately quitted by Carr, to give estimate for painting downstairs 2 coats and also whitewashing. 12:30 - Met Mr Bowers at Blagg's office and receiving warrant to distrain at Colliery "Ford Hays" near Longton for Rent 120 pounds. 1:30 - Started with Payne and trap and Matey(?) Plant and reached colliery between 2 and 3. Found 2 policemen in possession for workmen ways(? ), been there half an hour before us, but they gave up possession to us when they knew we were in for rent. Took inventory etc and left Matey in possession then came home with Payne. Busy removing Screen etc from Schoolroom and fixing up gas with Weson afterwards. It would be far better to have a separate Gas bag for the hydrogen - it is such a bother having to meddle with the gas fittings at every lecture. Evening - Doing up Balance Sheet re. Stonier's Hay Sale and forwarding him cheque due - 55 pounds 7 shillings. Morning - Out selling lecture tickets and to see Mrs Blagg, Rosehill, when she lent me a lot of slides of London views and animals at the zoo. Afternoon - To Wesleyan Schoolroom fixing screen and generally preparing for lecture. Evening - At Six o'clock gave about 200 school children an entertainment. At eight o'clock lecture for adults. The audience did not appear to be very numerous at first but the room seemed to fill up after 8. Mr S. Allen Esq made a very neat little speech at the commencement before he introduced me. The lecture passed off very successfully and after I had done with New Zealand, Mr Allen proposed a hearty clap to the lecturer which was cordially responded to. I then shewed them a lot of photos of animals at the zoo. Having piano and violin (Gibsons) it filled up all the gaps with music and made it all quite nice. Morning- To Woodhead Hall etc selling lecture tickets. Afternoon - Pack's(?) diatom deposit for Chicago and arranging with father Movins(?) regarding school tickets. Evening - Reading Room, copying journal names out A.B.C. adv. Guide. Morning - On Beer Business etc. Afternoon - Sorting tickets for lecture and colouring plan of Godwin's porch. Evening - Saw Mr Godwin regarding his proposed porch in market place and got orders to do it. Going over lecture sheets once more. Morning and afternoon - Looking after the Lower Bull's Head Cottages etc. Evening - To Rindle for rents and home office, writing letters etc. Morning - To Longton Market. Walked to Blythe Bridge. Jim Goodwin talks about going to New Zealand. 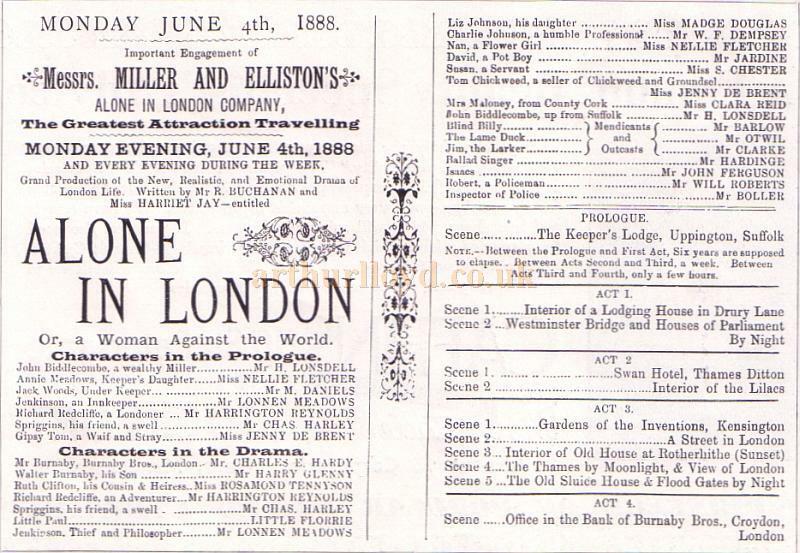 Evening - To theatre - "Alone in London". To Hartshill with George Yates for the night. Called at Hanley Police Station and saw Cousin(?) George Barker. Mr Cull sent for me this morning and said he went to Uttoxeter yesterday and saw Mr Wilkins, also Mr Rabone(?). He (Mr Cull) agreed to settle the matter by paying into Wilkins hands, the money 30 pounds 8 shillings and 5 pence due to us by Hugh Charlesworth for things bought at the Sale. Father to take action to recover that sum at the first favourable opportunity. The question of costs to be fought out and faxed(?!) to London. Afternoon - To Walton Villa, met Mr Holford, Wesleyan Minister, who says Mrs Sorrell, photogs wife ch.ch. New Zealand is his sister(????). After in market. Mr Turner(? ), Mod(?) Gate called and settled for his hay stack 10 pounds. Evening - Out selling tickets for lecture. Morning - Mr Cull sent for me to see a letter he had received from his counsel regarding late H. Charlesworth - says it was very important to take my father's evidence before the trial comes off. To Tean on Brewery Business but did nothing. Afternoon - To Rindle Cottages, looking them over, I found No. 2 and No. 5 fit for tenancy. I then went on to see the hay stacks in Blackberry Field. I found that Mr Turner had cut up all his stack except about 2 loads, altho he has not completed his payments. This is breaking the Conditions of Sale. I then went accross to see Mr Heath and ordered a load potatoes to be 6 shillings. Agreed with Harry Martin if the middle stack was sold through him to allow him half commission at rate of one per cent. Morning - Out in town, selling tickets for lecture - Cheadle, March 8th. Afternoon - Mr Cull sent for me so I went to his office and he took draft of my evidence re late Hugh Charlesworth. He gave me the draft to take home and revise. Evening - Walton Villa, making out Cash sheet for Bell and Co. and forwarding same. Morning - 7 o'clock to Dimmingsdale with Payne and Horse and trap to fetch Hugh Charlesworth. Found him in and brot him to Cull's office. We had a long time with Cull about the case to come off at Derby on Monday next. To various places on Beer Business and called in to see dad. He looks very flushed in the face - don't like it - his cheeks are sunk and he has the appearance of exhaustion. Afternoon - Office. Posting placards re. lecture to various places. At 4pm, went with Tom Beardmore to Isaac Campbells, Sawyer, Raddlestich, to put in distraint for rent for George Wibberley viz 24 weeks due Feb. 20th 1888 at 1 shilling and 4 pence = 1 pound 12 shillings. As Isaac promised straight off to leave that amount at his dad's on Saturday next, I thought best not to distrain, so I simply said that the Landlord has put the collection of his rents in my hands both now and for the future. 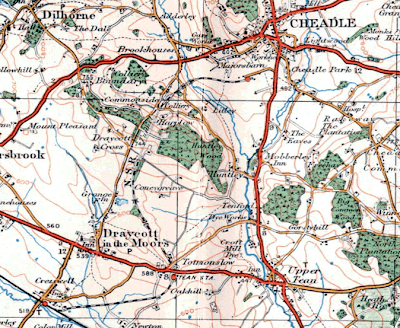 Then we returned to Cheadle. Evening - In Reading Room met with Mr. Bourne. He tells me that he has an amateur workshop, lathe, fret saw etc and also does photography. He has purchased photog(?) for 4 years and says he can teach it in 6 lessons. Mr Bourne said he could do a good deal towards securing a good audience for my lecture in Newcastle.